I'm Looking Forward to... Joe Hill's "The Cape"
While a little drunk at a Comic Bug (my local comic shop) function late Saturday night, my buddy asked me if I had been reading The Cape. I did a spit take over several displayed books (not really, Mike and Jun...I swear) and told my friend I would never read a comic book based on that horrible television show. I have my limits! Now the "Smallville" comic that's coming out soon....that's totally different! My buddy wiped the Newcastle from his glasses and told me I was an idiot. "Joe Hill's, The Cape," he said. I of course did one of those, "Oh Joe Hill's? Ah, yea...I know Joey. He's the best." I had never heard of Mr. Hill. 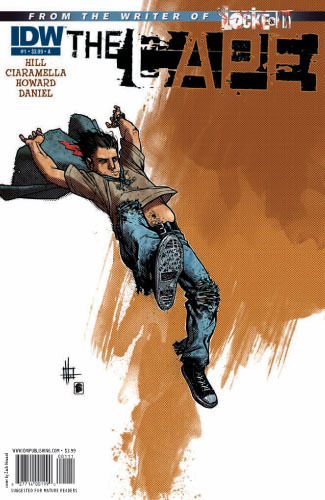 Joe Hill apparently created a one-shot titled The Cape, in 2005, that lead to a 4 issue mini-series which finishes up this week when issue number four piles on walls Wednesday. My buddy is more in the know when it comes to new good comic books, so I figured...what the heck, I'll buy the one-shot digitally and see what I think. I loved Joe Hill's, The Cape one-shot! I'm now looking forward to the mini-series.